“it’s hard being homeless, with bugs crawling out of your head. it’s not my fault.” and then he wandered off with his shopping cart, in the direction of the fisherman’s wharfs. we work in crazy town. we see this kind of stuff all the time (and this was one of the more sane encounters that i’ve had). we are on the doorstep of the fisherman’s wharf, the projects, and north beach. it is seriously crazyville around here. i thought i knew crazy from my time in new york city, but this is completely putting the crazy that i once knew to shame. this crazy is so off the charts that i sometimes find myself pinching my arm. did that really just happen ? thank god i’ve got my co-workers to confirm my daily disbeliefs. and lest i forget this: just a couple days ago, just outside my work, i found a somewhat old pile of what could only be dogsh*t, with a toothpick sized american flag stuck into it. it’s crazy town, alright, but it’s pretty fantastic awesome at the same time. so, between finding not just one, but two, new roommates on craigslist and the great deal of mess and stress that just seems to be my life right now (and has been since mid march), i’ve been distracted, busy, and overwhelmed. i have reached a point where i don’t really care anymore. bring it on. throw whatever obstacle in my way and i will clear it. and if i don’t clear it on my first try, i’ll hurl myself at it until i do. it’s been a month of “survival of the fittest” and “just make it work” and the like. i do, genuinely, doubt that, at this point, anything will phase me. so, by all means, hit me with your best shot. so what do i have to say for myself ? honestly, i will not bore you with the details. i am here to share something with you. rather, someone. her name is Jackie. she is one of the most amazing people i have ever met. you must read her blog. she rides horses and makes art, just like me. i met her many moons ago through the horse world. she and i have an age gap of around three years (i’m the elderly one) and because of said age gap, we never mingled while i was still showing horses. it wasn’t until just about a year ago that she i became fast friends. and i mean fast. over the course of one chat session we realized we are, essentially, exactly the same – save for our names. we’ve been talking ever since and seem to grow closer every day, whether i hear from her or not. we both have a profound love for Thelma & Louise and i am, with certainty, the Thelma to her Louise. end of story. she’s an amazing artist, but you wouldn’t know it from her blog because she doesn’t post her work up there. but believe you me, she’s one talented chick and not only have i seen her work in person, i have also had the privilege of watching her work (and even helping her work.. like that one time, at Portland’s Art Institute, when we stole a printing press. er, borrowed. we did return it the following day, after all). so, enjoy her ramblings and what-have-you’s. she’s awesome. exponentially awesome. she’s so awesome, in fact, that i can’t describe her. just read and then you’ll understand. p.s. i have some art to share, but since i am currently in a state of limbo (after having to very last minute shove my entire studio back into my 10′ x 10′ bedroom), it can wait. thank you for your patience. we will return after a brief commercial break. so this super-duper-more-than-awesome-totally-fantastically-magical-insanely-amazing-incredible-and-ridiculously-talented friend of mine named Jackie (yes, the same Jackie I’ve referred to before who resides in Portland, er, P-Town as we like to call it) introduced me to these pencils. or watercolors. wait wait wait. they are neither, they are both, but they are the best of both worlds. better than the best of both worlds because when you add water to this set of seemingly ordinary pencils they take on a life of their own. seriously. and if you do not own a set of them, you must. if you are still reading this, STOP NOW and go to your local art store and purchase a set immediately. i don’t care if you over withdraw your account because they are totally worth it. trust me. and if you can’t trust me, then trust Jackie cause she’s pretty much one of the coolest (er, the coolest) chicks ever. 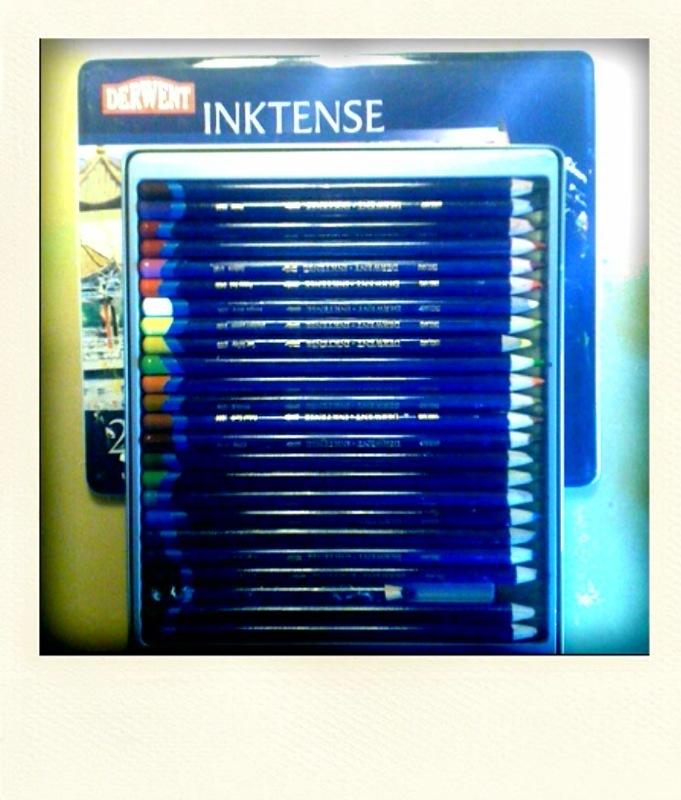 plus they are called, INKTENSE. what more do i have to say? so, yeah. that’s it. ‘that’ll do pig.’ and no, I am actually not clever enough to realize the irony of that expression within the context of my studio’s name, so i am hereby accidentally clever, but clever none-the-less, right?